I read an interesting fact this morning. It referenced the division that ensued among Christians when Darwin introduced his theory of evolution. Many argued that the theory of evolution would give rise to the moral decline of people. However, long before Darwin, the Apostle Paul said the moral decline of people would start if, and when, people failed to follow the Holy Spirit’s leading in their lives (Galatians 5:19–21). 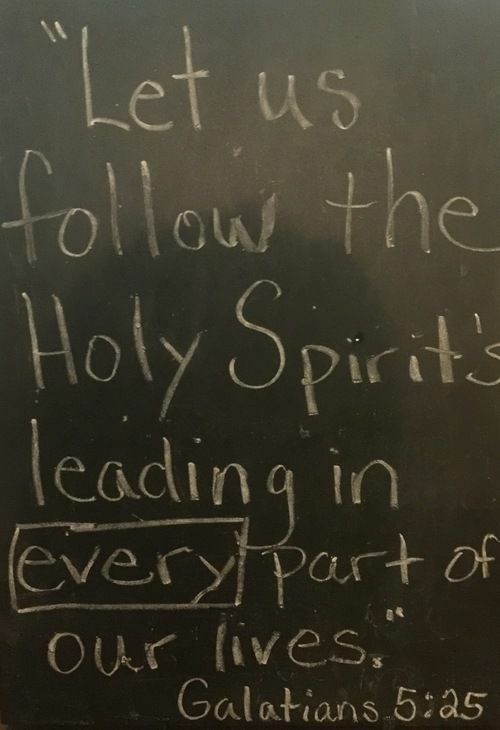 Paul’s response was to “Let us follow the Holy Spirit’s leading in every part of our lives” (Galatians 5:25). The problem is not necessarily with people discovering new things and introducing new ideas, but whether you are going to stand firm on your foundation and not waiver. We are still arguing about evolution, yes, but one of the bigger issues threatening the Church today is the concept of being content. Far too many people associate the idea of being content with being comfortable. They are not the same. The Greek word for content is autárkēs which means “contented with one's lot, with one's means, though the slenderest.” It means being content no matter the circumstances, and in most cases, this isn’t about comfort. Paul, who wasn’t leading a comfortable Christian life, left his comfortable life when he made the decision to pick up his cross and follow Christ. In this verse, “Yet true godliness with contentment is itself great wealth” (1 Timothy 6:6), Paul was exhorting Timothy to stay the course and not to be swayed by those who would contradict the teachings that promote a godly life (1 Timothy 6:3). Paul was warning Timothy that people might try and tell him that he could have both—contentment and comfort—but if they did, he needed to recognize that this was not true and to run as fast as he could from this false doctrine (1 Timothy 6:11). When we get too comfortable in life, we often become like those who are wealthy (regardless of whether we have an abundance of wealth or not). We tend to be selfish, complacent, and less concerned with the plight of others. Sadly, sometimes our comfort even leads us to make foolish and harmful decisions. Jesus was never comfortable, but He was content. The disciples after being filled with the Holy Spirit were never comfortable, but they were content. Many missionaries and Christians in the past were never comfortable, but they were content. Many believers today are not comfortable, but they are content. Some would say that not being content is wrong. Some might even quote Philippians 4:11, “Not that I was ever in need, for I have learned how to be content with whatever I have.” But there’s a difference between not being at peace and not being content. I believe the stirring you are experiencing is not because you don’t have peace, but because you aren’t content to be comfortable. Bobbie Houston in her book The Sisterhood says, “Change never occurs without first a willingness to be made aware—and willingness to be made aware is the catalyst of all change.” Most who are comfortable will rarely eagerly take on change. There’s a reason someone has coined the phrase, “Get out of your comfort zone.” If you are not content to be comfortable, you are much more likely to be open to change. In the Christian sense, this also means being led by the Holy Spirit in every aspect of your life whether you like it or not. Jesus warned that the cost of carrying your cross would be great (Matthew 10:37–39). There is a cost to laying down all your comfort, but there is a great reward in your willingness to be content. Darwin’s theory of evolution shook and divided the Church because if people actually believed they evolved from animals, they might act like animals and ultimately stop believing in the Creator. The same can be said of the Church when it becomes too comfortable. We start looking more like the world and acting like the world, and we, too, stop believing in and relying upon the Creator. We can’t allow that. We, the Church, need to be content, but we don’t need to be comfortable. Lost souls out there need Jesus, and God needs us to deliver His message of Hope.